A skin tag is a common, harmless and benign skin growth that looks like a small piece of hanging skin which affects both men and women. Although they vary in appearance, they are usually smooth or slightly wrinkled and irregular, flesh coloured or slightly browner. They can also vary in size and are commonly found on the neck, underarms, eyelids, under the breast and groin. They usually occur where skin is constantly rubbed against skin or clothing. The aim of the treatment is to cut off the blood supply to the skin tag so that it withers and dies. What should I expect to see afterwards? After treatment the surrounding skin may appear red and feel warm for a few hours. The tag may turn a little darker in colour, shrink and form a small scab which drops off within 5-10 days depending on the size. 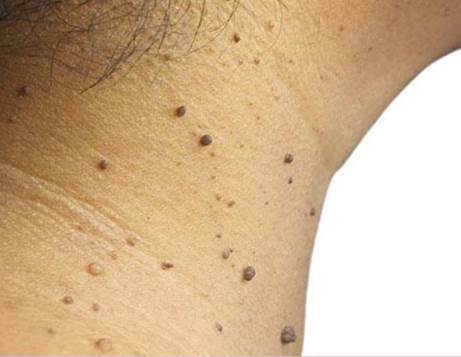 Usually between 1 and 3 treatments are required depending on how well the skin tags respond. You may feel a very small ‘pin-prink’ or a slight heat sensation, but this is very quick and short lived. The minimum charge is £40 and price may increase depending on the amount/size of skin tags to be treated. For 2-3 days after skin tag removal, bathe the area in cool water only. Avoid the use of perfumed products on the skin e.g. soap, cleanser, moisturisers etc. Each time the area is bathed apply a small amount of Aloe Vera gel to soothe the skin and aid the healing process. DO NOT PICK OR SCRATCH. Leave the area to heal naturally. Consultation is free and allows you to be fully informed in a no-pressure, friendly, relaxed environment before you start your treatment.